If you are looking for a way to conceal your valuables and keep them safe, protected, and out of the way, a wall safe may be the right way to go. 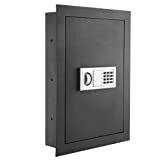 Wall safes offer some excellent advantages. Because this type of safe sits inside your wall, it does not intrude on your space at all, making it an excellent option to conserve square footage in your home or office. Wall safes can also be hidden behind pictures or other décor on your walls, making it harder for thieves to locate them. They do have some drawbacks, however, so it is important to make sure this is the right type of safe for your needs. Considering purchasing a wall safe, but not sure what product will best suit your needs? Check out our comparison table of the top wall safes to learn about some of the best products on the market right now. Want to learn more about wall safes before you start shopping? Read on to discover key questions to ask during the buying process as well as important features and factors to consider when selecting a wall safe. 1. Is a wall safe ideal for your needs? As mentioned, wall safes have their pros and cons. You need to consider both when deciding whether to go with a wall safe or a different type of safe. If your goal is to keep your valuables out of sight and out of mind, a wall safe works well for that. For those living in tight quarters, there are few better options. The downside is that wall safes often are not as securely bolted in place as floor safes can be. So if an intruder does find your safe, he or she may simply abscond with it rather than try to crack it right then and there. You also will notice that while some wall safes are fire-resistant, fireproofing is not a common feature in this category. 2. Where will you install your wall safe? If you do decide the features of a wall safe are the best fit for your needs, your next step should be to ask yourself where you will be installing it in your home or office. You need to measure the space so that you can shop for the exact right dimensions. The best location for your wall safe will be one which is convenient for you, but where burglars will not think to look for it. Installing a wall safe takes some time, effort, and work, but it does not have to be complicated. If you are daunted by the prospect of installing a wall safe, shop for a safe which includes easy installation features such as pre-drilled holes for anchoring or a frame around the edge to conceal the lines you’ve cut into your wall. This is very important. The safe you buy should be well-constructed out of sturdy materials. Solid steel is a good choice. It should resist tampering by hand as well as by tool. Pay close attention to the hinges, as these can be a weak point on a wall safe. If possible, try to pick a safe which has been subjected to exhaustive tests and survived to earn a high rating. For example, if a safe has received the RSC rating, that means that it withstood five minutes of tool attacks. A safe which has earned the TL-15 rating has endured 15 minutes of tool attacks. TL-30 has withstood half an hour of tool attacks, and so on. Obviously the higher the rating, the more secure the safe. 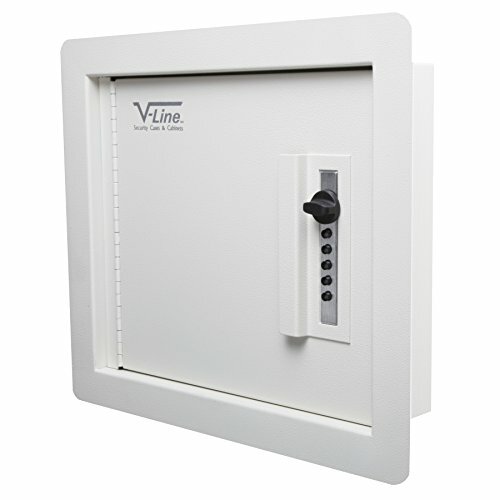 Different wall safes provide you with different means of access. Some take PIN codes, which may be pre-set or customizable. Others allow you to access the safe using your fingerprint. Some combine biometric and PIN code technology. Still others include backup keys. Choose a wall safe which provides you with the most convenient access options. If there will be multiple users, you should make sure that multiple fingerprints or codes can be stored as needed. A lot of wall safes do not feature fireproofing at all. You will find a wider selection if you shop for a different type of safe. That does not mean you cannot find what you need, however. 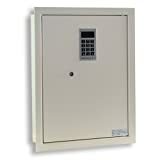 Some wall safes are UL-rated for fireproofing, and can protect documents or even data from being destroyed in a blaze. Keep in mind that no safe can protect its contents from heat damage forever. Check the temperature and time ratings to find out how much heat the safe can withstand and for how long. Check to find out how your safe is powered if it uses an electronic lock. What type of batteries does it require? How long do they last before they need to be replaced? Are they standard or proprietary? What happens if the batteries die while the safe is locked? Can you still get into the safe using a backup key? Some wall safes include additional features to secure your valuables as well. 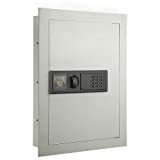 For example, you can buy a safe which includes re-lockers. If a burglar is attempting to access the safe or carry it off, the re-lockers go into action to provide an additional layer of security. Another security feature which some wall safes include is a lockout penalty. If a burglar inputs a series of incorrect combinations, the safe will ignore further attempts at access for some period of time (15 minutes for example). That may be enough of a delay for security personnel to arrive. Some wall safes also include “stealth mode” where beeping sounds which are usually offered for feedback and ease of use are silenced. That way if there is an intruder in the house and you need to get your valuables out of the safe discreetly, you can do so without alerting the home invader. Those in search of an electronic wall safe which is easy to install and which was built to last should take a look at the Paragon 7750. This safe measures 22” x 16” x 4” and provides you with flexibility, durability, and ease-of-use through features such as an exterior frame, carpet mat padding inside, and a programmable lock. Even beginners can install this safe with ease. One helpful feature is the frame around the safe. This goes over the lines which you cut into your drywall. That way if you cut them unevenly, no one will ever know. They will be hidden from view. The safe also includes pre-drilled holes as well as anchor bolts. This makes for fast and easy anchoring. Choose from two methods to open your safe. The main method to open the safe is using a key code. If you forget the code, however, you can use a key to get inside. There is a 10 year manufacturer warranty. This is a strong testament to the safe’s stability and durability. It is made out of solid steel measuring 1/8” in thickness, and includes internal hinges designed to be tamper-proof. Key access is a pain. The reason is that the key slot has been concealed behind the keypad plate. This was probably done for reasons of discretion, but it means you need to unscrew the plate to use the key. So it really should be termed key-and-screwdriver access. Looking for a wall safe which emphasizes ease-of-use while providing you with versatile storage space for your valuables? 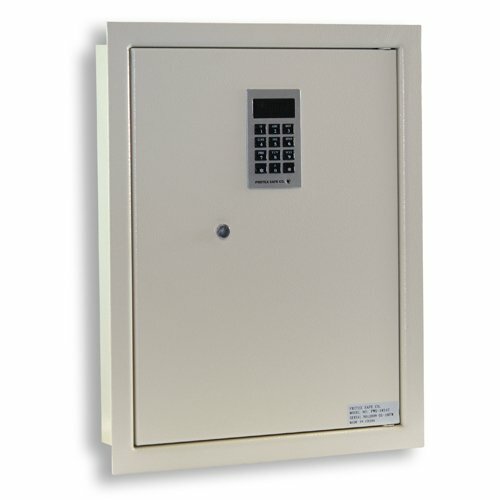 The Protex PWS-1814E Electronic Wall Safe can fit between 16″ o/C wall studs. The interior space measures .44 cubic feet, and the unit includes plenty of great electronic features that enhance its functionality. There is a powerful electronic locking system. The dual live motorized chrome bolts provide structural integrity, more effectively bolting the door in place when the safe is locked. When the safe is unlocked, the bolts push open the door automatically so that you can quickly and easily access your valuables. The safe contains removable shelves. These two shelves can be used to help organize your possessions in the safe, or you can take them out if you need to fit larger items inside. The flange around the safe hides your drywall cuts. If the hole you cut in your drywall during the installation process is rough, you do not need to worry about fixing it. It will be concealed by the flange around the safe. There are backup power and entry options. What if your internal battery should fail while the safe is locked? This safe gives you the option of hooking up an external power source. The PWS-1814E also comes with a set of backup keys, offering you yet another alternative to access your valuables. It is easy to reset the code on mistake. If this happens, obviously you will have to rely on your backup key to get into the safe. You will then need to reset the code again. 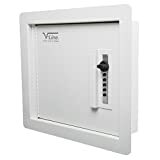 Customers who are looking for a sturdy wall safe which is easy to install and which fits flush against the wall for a clean, finished appearance will want to take a look at the V-Line 41214-S Quick Vault. 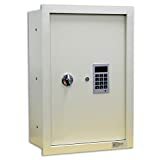 Designed with firearms and other valuables in mind, this in-wall safe measures 13″ x 11.75″ x 2.5″ inside, and is reinforced with an inner steel frame to ward off efforts to pry the door open. No batteries are required. This safe includes a really cool push button system for unlocking. The experience is like that of using an electronic keypad, but the push buttons are actually mechanical. That means that no power source is needed. You get the reliability and simplicity of a combination lock, but the ease-of-use of a keypad lock. 1,081 different possible combinations can be programmed into the lock. Programming itself is a fast and easy process. The safe includes a flange. The flange around the safe conceals any mistakes you make cutting your drywall for installation. It sits close to the wall for a smooth look. This flush placement of the safe also makes it easy to cover the safe to conceal it from view. Configure the interior space as needed. The shelf inside the safe is adjustable so you can adapt it to your space requirements. Some units may be shipped out with a defect. These units may fail to open when needed. Thankfully this flaw only seems to affect a very small percentage of V-Line 41214-S Quick Vaults.